Teenager Thomas Landale jnr, b. 1830, died at sea on 19th September 1848 on board the barque Rattler six weeks out from London on the voyage back to Hobart, Van Diemen’s Land (Tasmania), Captain Edward Goldsmith in command. 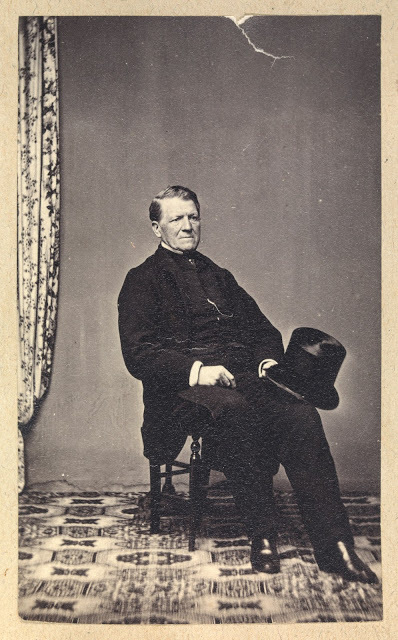 He was returning from studies in England, the son of medical practitioner Thomas Landale snr (1795-1851) and Harriett Dry, sister of politician Richard Dry. 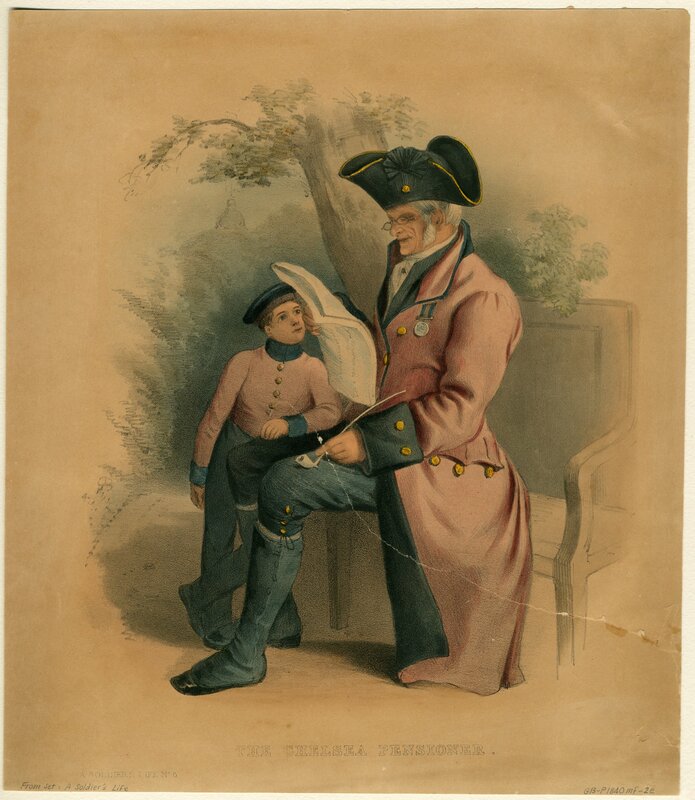 Captain Edward Goldsmith performed the burial rites at sea in the presence of the only other family member on board, younger brother Richard Landale, b. 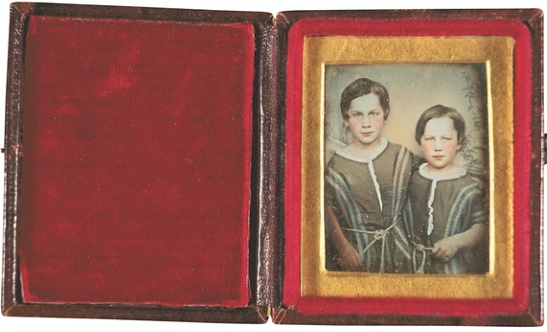 1831, barely seventeen years old. Presumably the body was disposed of soon after death rather than kept on board until first landfall, which might have been the Falkland Islands where Captain Goldsmith routinely berthed to resupply his crew. On arrival in the Derwent at Hobart ten weeks later, Port Officer Lawrence recorded the names of all passengers at the time he boarded the vessel, but recorded nothing about the death at sea. Although death notices had appeared in the press by the 9th December 1848, the death itself was not listed in official death and burial registers, making it difficult to ascertain both the cause of the teenager’s demise and location of a cemetery memorial. 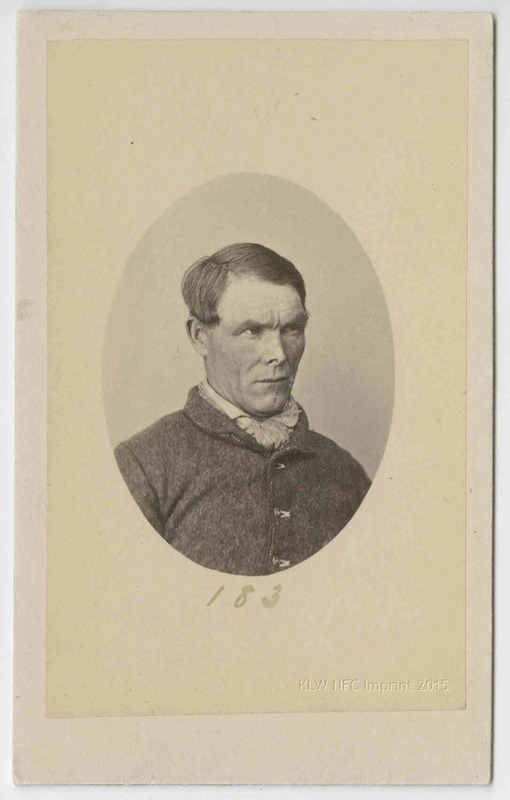 On the 19th September last, on board the Rattler, while on his return to this country, Thomas Landale, junior, Esq., aged 19, eldest son of Thomas Landale, Esq,. of Elphin. DEATH AT SEA. – We regret to observe that the eldest son of Dr. Landale who went some time since to England, to complete his education, died during his passage out on board the Rattler. 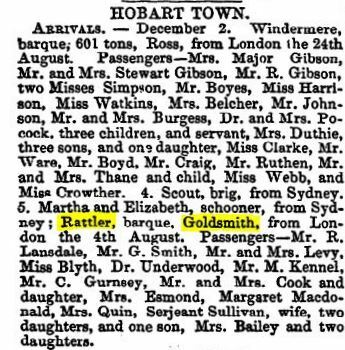 The Sydney Shipping Gazette listed the names of passengers arriving at Hobart Town, 5th December 1848, on board the Rattler, barque, Goldsmith, from London [departed 4th August 1848], but no mention of the death at sea of Thomas Landale jnr. Apart from younger brother of the deceased, Richard Landale, whose name was misspelt in the Sydney Shipping Gazette notice as Lansdale, the other passengers were Mr. G. Smith, Mr and Mrs Levy, Miss Blyth, Dr. Underwood, Mr. M. Kennel. Mr. C. Gurnsey, Mr and Mrs Cook and daughter, Mrs Esdmond, Margaret Macdonald, Mrs Quinn, Serjeant Sullivan, wife, two daughters, and one son, Mrs Bailey and two daughters. This is a re-score of a scene from Master and Commander (2003). The music was recorded with a string orchestra at New York University on 2/24/15 as part of the film scoring master’s program. 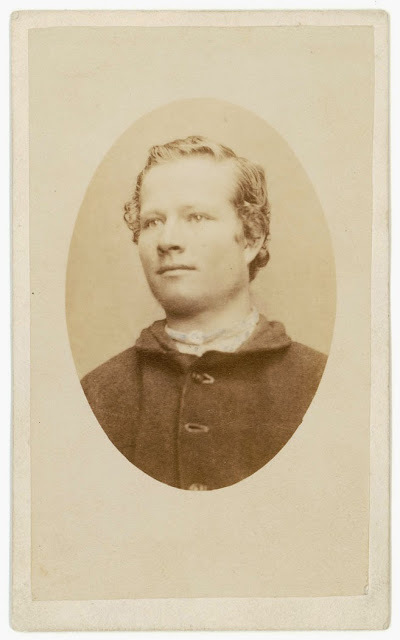 How the family grieved for the death of Thomas Landale jnr was recorded by Melbourne-based diarist Annie Baxter (1816-1905), who maintained a close relationship with politician Richard Dry (1815-1869), uncle of the deceased boy, from a previous time when they first met in Hobart. Her liaison with Richard Dry intensified when her marriage to Lieutenant Andrew Baxter (1813-1855) had ceased in all but name only. 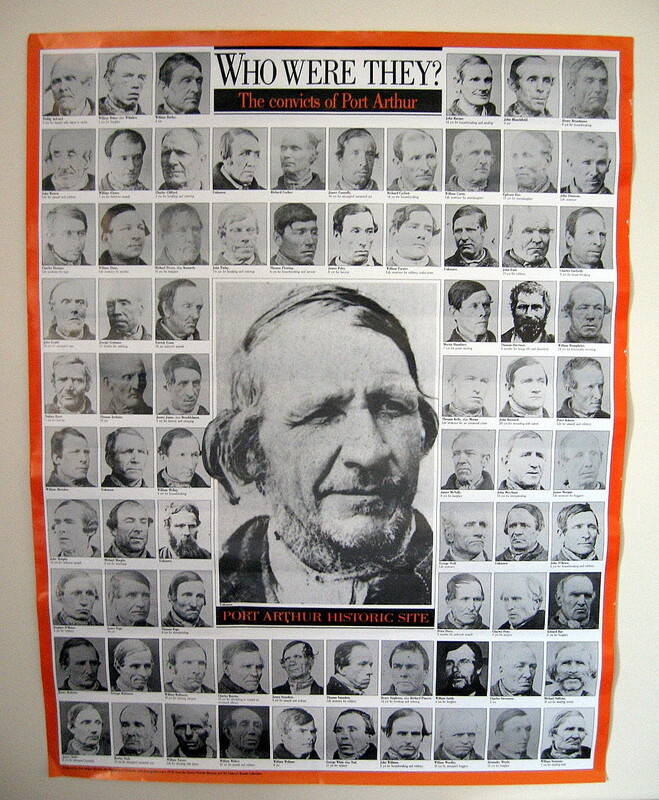 Her visits to Tasmania exactly coincided with the arrival of Captain Edward Goldsmith and the Rattler between the years 1847 to 1849. She stayed with her brother Captain William Hadden of the Royal Engineers at Davey St. Hobart, near the corner of Harrington St,, close to photographer Douglas Kilburn’s house at Number 22, a few doors along from Stewart’s Brewery and Captain Goldsmith’s house at Number 19. St David’s Burial Ground was opposite, and across from the burial ground was the new St Mary’s Hospital, erected in 1847 which Annie Baxter frequented for the hot baths and the young male clientele. 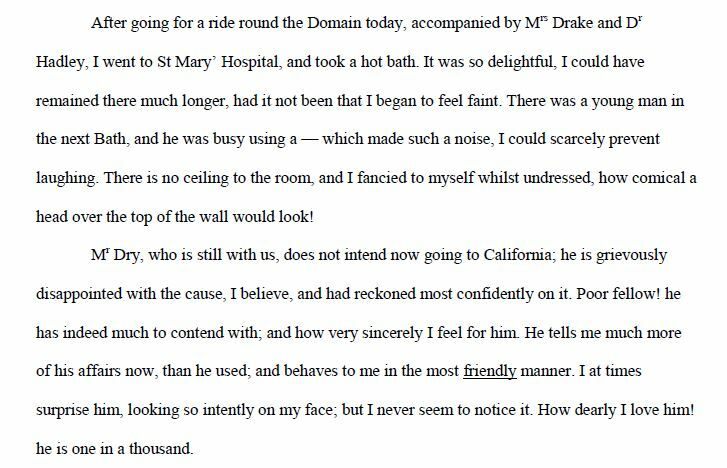 On one occasion she heard “a young man in the next Bath and he was busy using a – which made such a noise, I could scarcely prevent laughing.” What was he using? Source: Toni-Anne Sherwood (2010) p. 282, August 2[7th]. This sketched portrait ca. 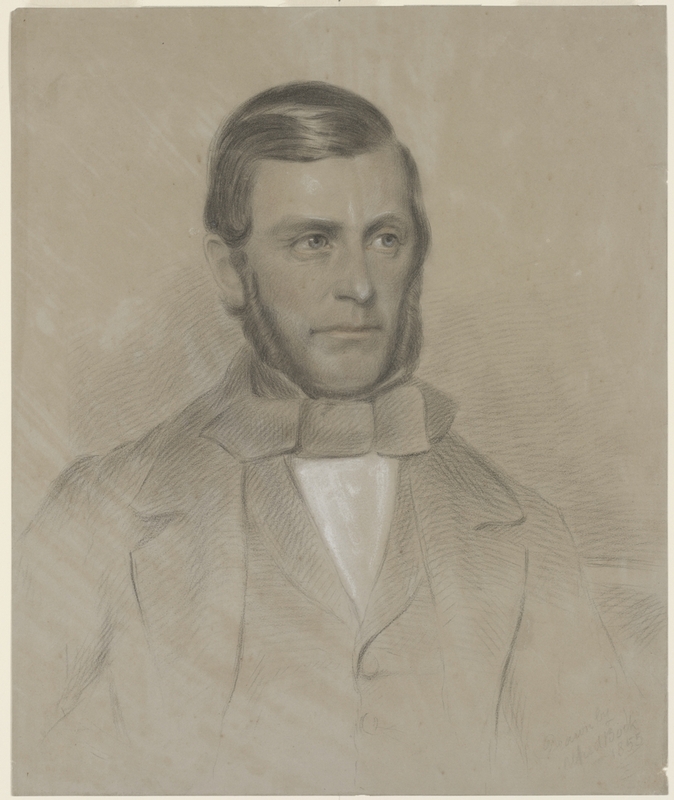 1850 by Thomas Bock (below) is an almost contemporary representation of Richard Dry, Annie Baxter’s lover who behaved to her “in the most friendly manner … How dearly I love him!” she confided ecstatically to her diary. Quite obviously, the word “friendly” could not express enough how deeply satisfying she found his love, so she underscored it. According to Sherwood (2010, p. 44), no portrait, painting or photograph was found among the diaries or seems to have survived of Annie Baxter herself from these years, although in the diaries Annie Baxter mentions a “likeness” taken of her by cartographer and cartoonist George Frankland (Sherwood p.91), and a gift of a cameo brooch from Dr Hadley (Sherwood p.261). Annie Baxter led the giddy life of a flirtatious socialite while fitfully despising herself for confiding so much of the prattle to her diary. 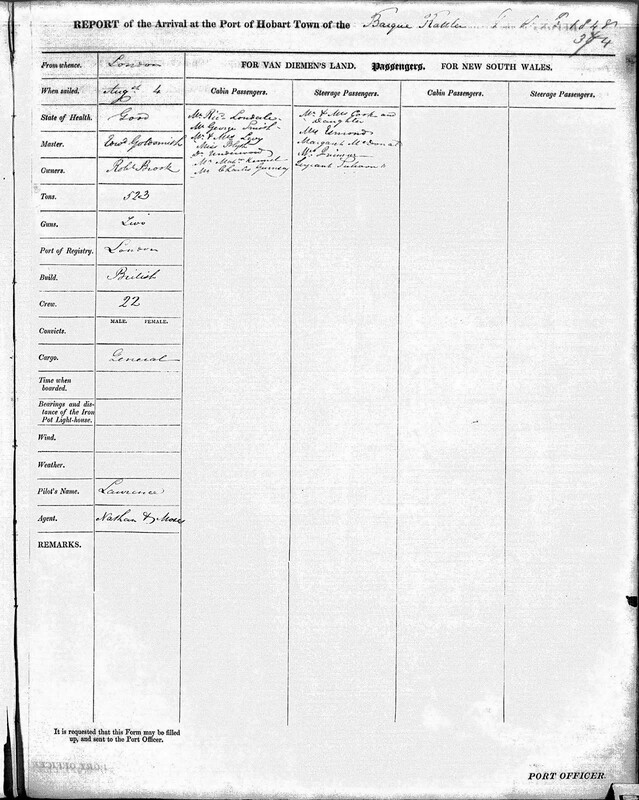 During the summer of 1848-49 when Captain Edward Goldsmith was in town, she went riding with him, dined with him, requested he import plate for her, spent the night under the same roof as him at Sharlands, New Norfolk, on 17th December 1848, and probably dallied with him as was her custom with men of her class regardless of their respective matrimonial status or prospects. 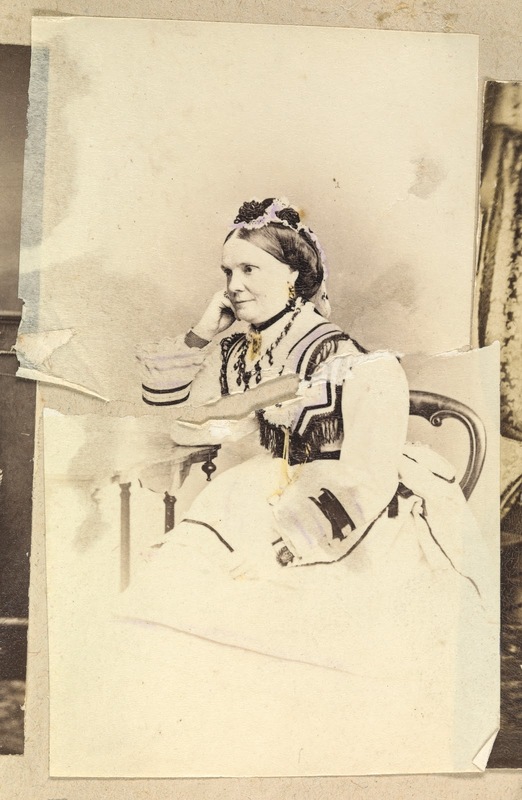 In late 1849, she met Mrs Elizabeth Goldsmith who arrived at Hobart with her husband and two sons on the Rattler, after which no further mention was made of Captain Goldsmith. 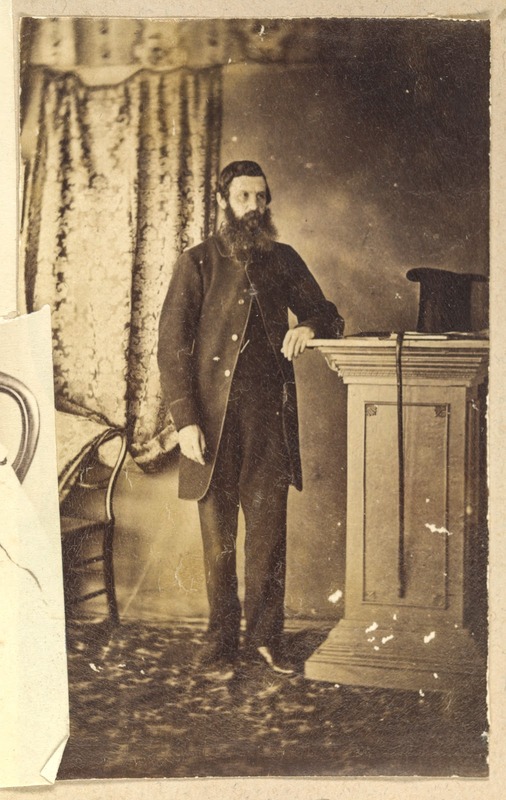 Another man by the name of Goldsmith – Adolphus Goldsmith who held large leases on land at Trawallo, Victoria (40,000 acres) and at St. Helens, Victoria (25,000 acres) – is mentioned two or three times in her diary as Mr. Goldsmith while visiting Victoria, not to be confused with Captain Goldsmith and presumably no relation. 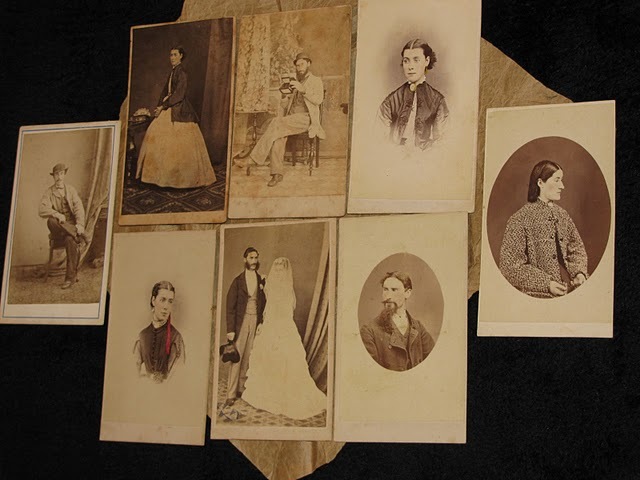 By March 1850 Annie Baxter had met and formed a relationship with a new paramour, Josiah Thompson of HMS Maeander. She departed Hobart for England in 1851, married again in 1857 to Robert Dawbin on 1st September at St Paul’s, Melbourne, and concluded her diaries n 1868. 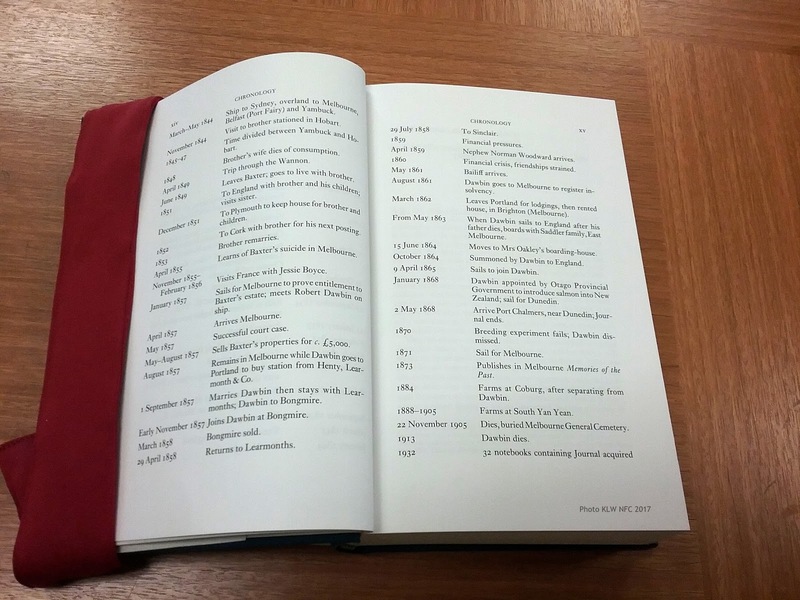 Annie Baxter in Van Diemen’s Land : an abridged and annotated version of her journal, 1834 –1851. 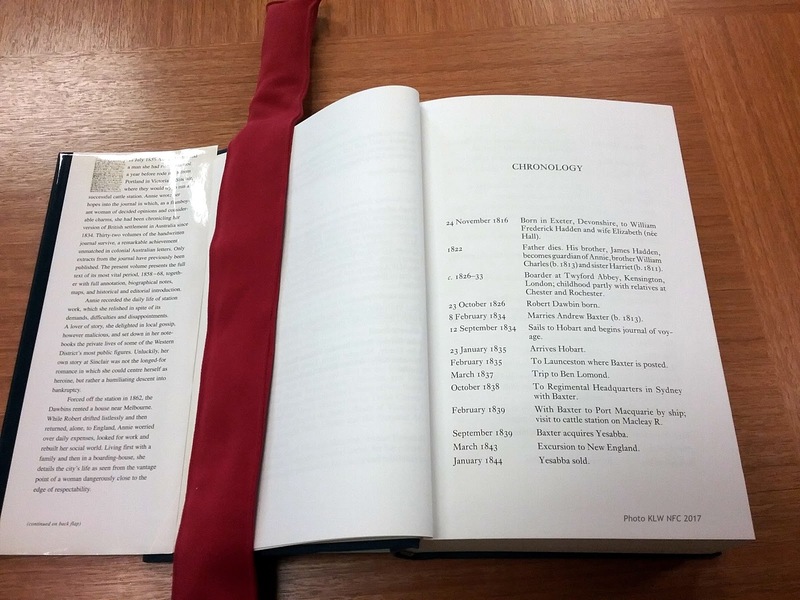 PhD thesis, University of Tasmania. June 2010. 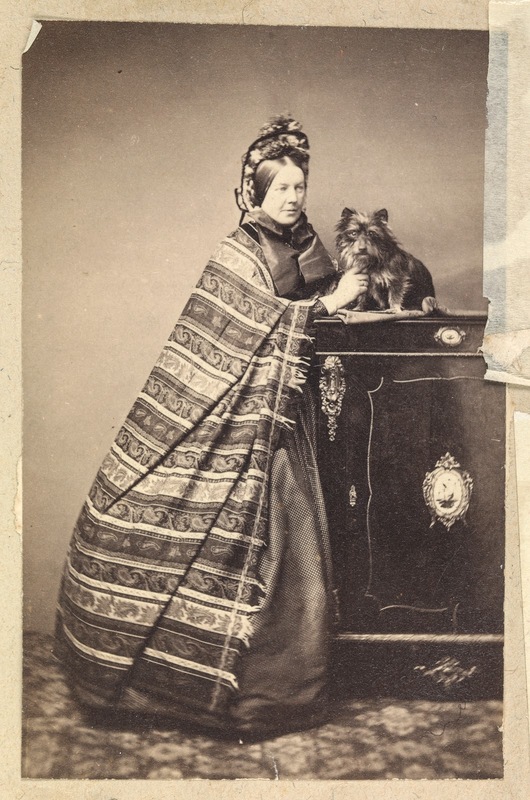 Richard Dry on left, his wife Clara Meredith, whom he married in 1853 on right, posing with a terrier. Later, Sir Richard Dry, Tasmania’s first locally-born Premier, and Lady Dry. 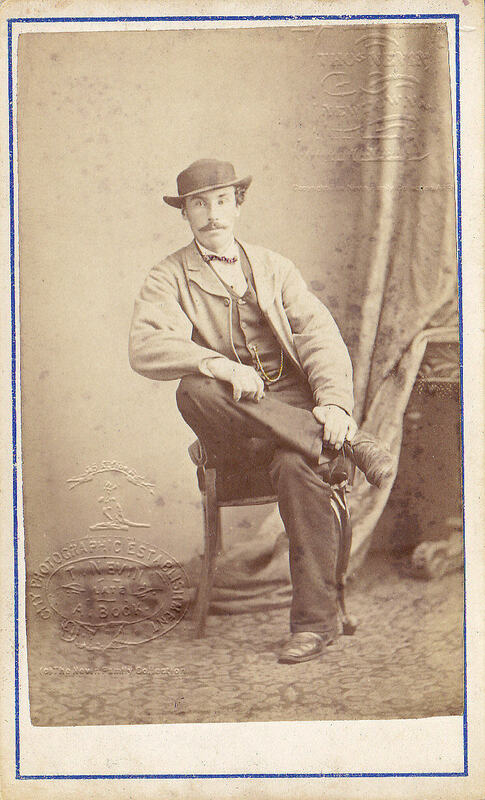 The photograph of Richard Dry was taken in an untidy studio, possibly Alfred Bock’s or Thomas Nevin’s, ca. 1860, and that of Clara Dry may have been taken by the Frith brothers, Murray St. Biography at ADB: click here. Annie Baxter met Captain Edward Goldsmith for the first time one year earlier, in January 1847: “a Captain Goldsmith of the Rattler” she recorded, pouty and piqued with interest: “a certain [insert name here] …” is the usual full expression to denote someone special. Such was her desire to impress him, she took the reins of the horses and carriage they rode in to visit William Sharland’s hop plantation at New Norfolk in the Derwent Valley, much to the amusement of Captain Goldsmith seated behind, chaperone on this trip to Elizabeth Oke Buckland, daughter of Hutchins School headmaster John Buckland, married to chief justice Sir Valentine Fleming in 1852. 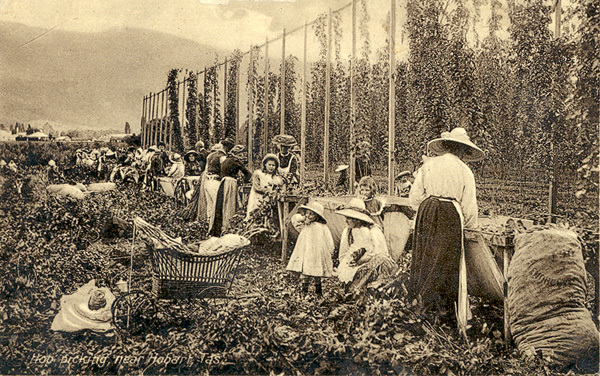 William Sharland had received “new kinds of hops” imported on the Rattler, 50, 000 hop pockets on one shipment alone (Courier 17th November 1847), sourced from the Goldsmith plantations and nurseries at Chalk in Kent. Captain Goldsmith’s excursion to Sharland’s extensive plantation was to see how his plants were prospering. Annie Baxter made the same journey again through the Derwent Valley one year later with Captain Goldsmith (1848), this time chaperoned by another of her paramours, hotelier Dr. Hadley. January 19th Tuesday. Only a fortnight elapsed without my writing in this book = since when, I‘ve been to New Norfolk (this day week by the bye,) in company with Miss Buckland and a Captain Goldsmith of the Rattler;  I drove all the way there to the amusement of the persons driven. We breakfasted at Mrs Sharland‘s: she is a pretty little wayward thing, and looks so young to have seven children! Three of the Misses Shaw are staying with their sister, and are ladylike, nice girls. The eldest will in all probability become Mrs Robertson, and in such case – I pity her. After luncheon, we rode to see Mr Sharland‘s hop-garden; it is very pretty, to see the hops in the stage they are now in, and there appears to be a good crop this season. November 9th Thursday  – It is between 3 and 4 o‘clock, now, and I‘m sitting in the silence of “sleep”, writing by the fire! I‘ve been in downright agony for some time, but am now almost free from pain in my unfortunate face. Laudanum! my old comforter, has been had recourse to, and I hope to get some sleep soon. I‘ve finished the book Miss Buckland very kindly lent me, called, “Rose, Blanche & Violet”; it is prettily written – and the second character is so womanly & faulty, that I consider it beautiful! Violet, is more my own stamp, and I can therefore perceive  her faults easily…. December 7th Thursday  On Monday Mrs Roberts gave a dance, and I believe it went off very well, William went to it, but I remained at home, & had the pleasure of Dr Hadley‘s company. He improves vastly on acquaintance, and is very agreeable. Tuesday morning Mr Dry came to sit with me, and told me of poor Tom Landale‘s death on board the Rattler, about six weeks after sailing; This vessel came in the night before, and that is the reason why he did not come to see me. Poor fellow! he was sadly cast down, as Tom was his favorite; and he was very fond of him. December 16th Saturday. At 10 o‘clock,Captain Goldsmith and Dr Hadley came, and soon after we all started for New Norfolk; I drove after the first 9 miles; and we reached our destination about 1 o‘clock. We drove to the Archdeacon‘ as arranged before, and at 3 had dinner. Mrs Marriott looks very pretty, and as well as ever I saw her looking, altho‘ in such deep distress about her servants, whom she cannot manage to keep for any time. She amused me very much in saying that she could not attend to her birds, and asking the Archdeacon to get one of the men to feed them! Sarah Anne, eldest daughter of Deptuy Commissary General George MacLean and his wife. Pregnant/ In the family way (French). November 27th Tuesday  All the afternoon was passed at my Frame, and my work progresses rapidly. The Rattler came in last night; and W. C. went on board today to see Mrs Goldsmith; They have brought me a box from Harriet [Annie’s sister]. 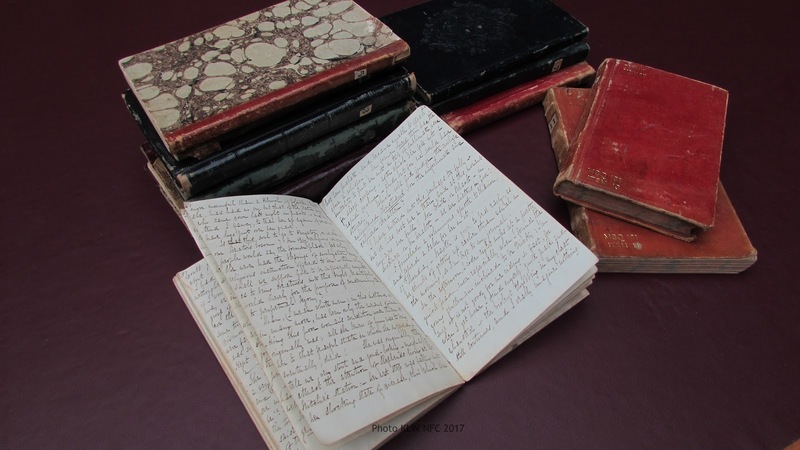 I don‘t know whether I am very curious to see the contents, but I would like to know what they are..
December 11th Tuesday  – Yesterday was such a broiling day; but in the afternoon, we had a gallop on the sands, and regularly warmed the horses. We were home by 4 o‘clock, and I then worked at my worsted. I am now reading “the Emigrant” by Sir F. Head. It is quite a political work. Messrs Dry & Hollings, and Captn Goldsmith paid me a visit yesterday morning; the former brought me a note from Mrs Chiene, who is just moving to Perth – where [she] is going to reside. Dr Landale, who had a stroke of par[ ], is getting well again. This morning Mr Tillett called to say Adieu to me, as he sails this afternoon in the Endora, for California; so I gave him my note to Mr Dyson Aplin. The barque Rattler was an attraction to visitors at the Hobart wharves. Open days were scheduled when tours on board were invited (28th Jan. 1848-1849). The Regatta was the other great attraction. Captain Goldsmith had been a committee member, umpire and judge of the annual Regatta races from his first engagement by Governor Sir John Franklin in 1842. In 1849, it was Annie Baxter’s brother William Hadden who drove Captain and Mrs Goldsmith to the Regatta grounds (Nov. 30th 1849). 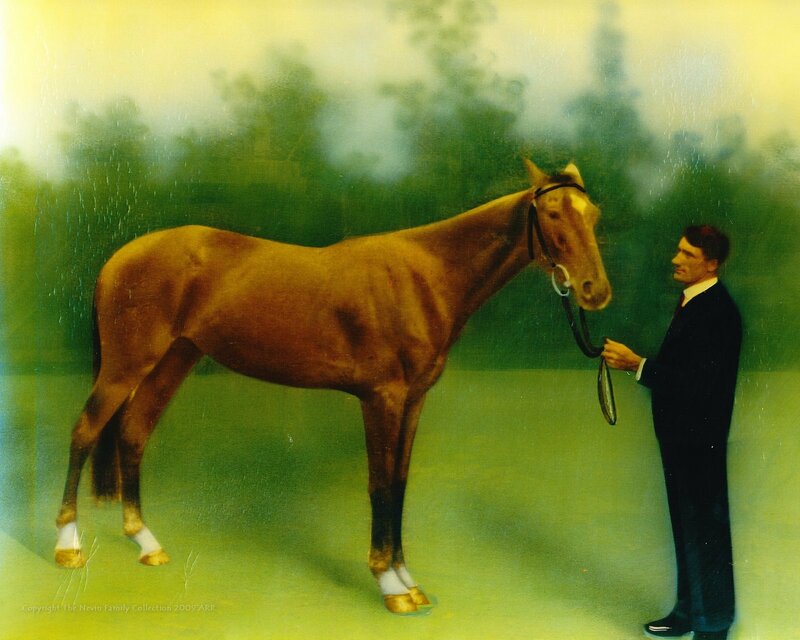 Annie Baxter was fond of riding and could manage horses whether hitched to a carriage or mounted. She recorded in this entry of December 11th, 1849, that “we had a gallop on the sands” and although not stated, she presumably rode side-saddle. 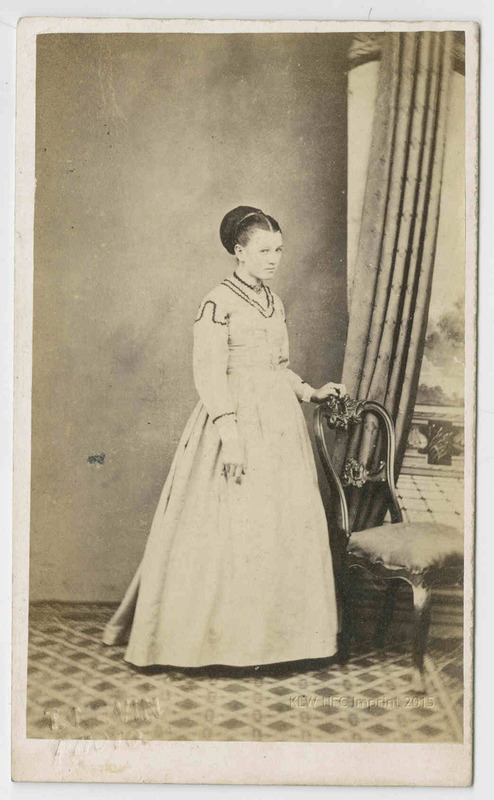 This photograph (below) taken of Mrs Hutchinson (ca. 1870s?) 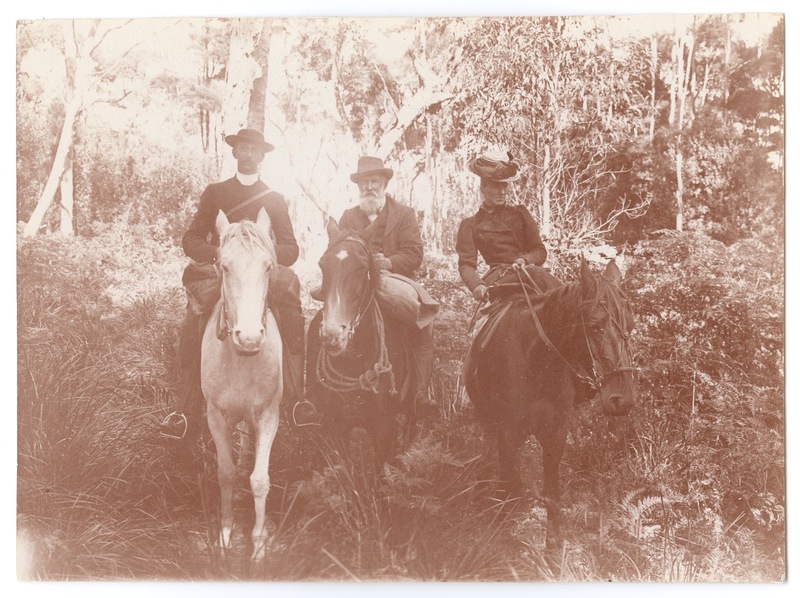 riding side-saddle shows how much strain the position placed on the upper torso and hips. The goods arriving on this voyage of the barque Rattler from London to Hobart, Van Diemen’s Land could not have differed more from the huge quantities of alcohol which arrived on the Rattler‘s voyage in 1850. On this voyage, Captain Edward Goldsmith had sought out from London’s merchants every household item a settler and small business trader would need, from slops (simple clothing) for their servants to tools, japanned ware, clocks, muslins, china figures, blinds, bedding and bibles, and even a freezing machine. 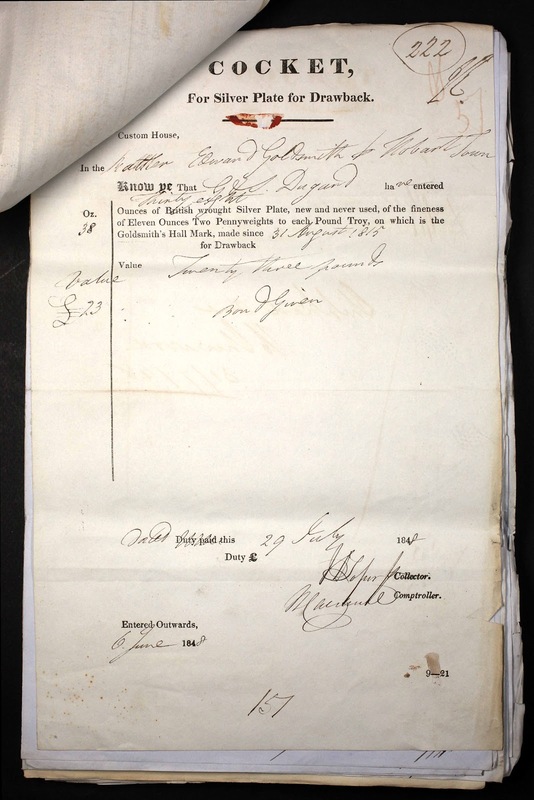 In amongst all these cases, boxes, casks, crates and barrels was Annie Baxter’s box of plate, possibly this shipment of silver plate exported by Dugard (London), documented on the Rattler‘s Cocket no.222; thirty eight ounces of British silver plate, value £23 …. Source: The Courier (Hobart, Tas. : 1840 – 1859) Wed 20 Dec 1848 Page 2 SHIPPING NEWS. 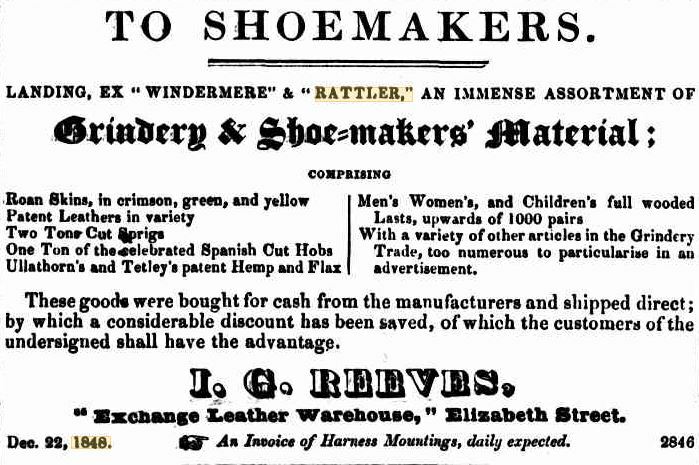 “Per Rattler, from London – 3 bales canvas, 6 cases lucifers, 9 cases hats, 20 bundles spades, 10 kegs white lead, 12 cases trunks drapery, 2 trunks shoes 37 pockets hops, 12 packages ship chandlery, 1 crate sickles, I case brooms, I case woollens, 1 bale cottons, 100 cases French wine, 14 quarter casks 19 cases port wine, 30 quarter casks sherry, 20 cases do, 10 cases port wine, Nathan, Moses, & Co.; 12 crates crockery, H. Marks; 1 case blinds, J. Milward; 2 cases leather, 3 cases cottons, 1 case Cologne water, L. C. Stevenson; 7 cases 2 casks hardware, 1 cask glass, 1 cask white lead, 16 barrels tar, 2 casks white and red lead, 4 casks linseed oil, 17 cases paint oil and turps, 2 hampers varnish, 2 barrels colours, Stevens and Harcourts; 2 cases muslins, J. Guthrie 1 case books, R. S. Waterhouse Brothers; 1 case millinery E.P Bedford; 6 casks grindery, I. G. Reeves; 8 hhds hollow-ware, 14 casks ironmongery, 2 cases fenders, 1 case blinds, 1 case silver plate, 20 kegs 6 casks nails, 1 case ? lines, 1 case daguerreotype plates, 11 casks hardware, 1 case maps and charts, 1 bundle sash tools, 138 pieces plough metal, 30 barrels cement, 1 case German silver, ? cases japanned ware, 5 bales paper, 1 cask planes, G & T Dugard; 1 bale cottons, 1 case drapery, 4 casks glass, 3 casks plaster of Paris figures, 1 case turned wood, 2 crates ornamental flower pots, A. Spurling; 1 cask saddlery, 30 hhds 134 barrels beer, 30 casks nails, 1 cask hardware, 34 barrels Burton ale, 30 pockets hops, Kerr & Bogle & Co.; 6 cases cutlery, 12 barrels toys, 11 cases lucifers, 8 cases plated ware and cards, 3 casks brushware, 19 cases 25 casks glassware, 2 bales carpets, 3 crates ironmongery, 8 cases plated goods and whips, 1 keg tacks, 1 case fringe, 2 kegs pickled cucumbers, 1 keg herrings, 1 box cruet frame, 1 case books, 2 cases cottons, 1 case pewter ware, 2 cases prints, 1 case metal ware, 5 trunks boots and shoes, 1 case slops, 2 cases soap, 1 case dowlings, 1 case cabinet work, S. Levy; 11 cases 8 casks drugs, J. H. De La Hunt; 2 cases drapery, G. W. Walker; 4 cases saddlery, R. Webb; 8 cases linen goods, 2 cases colours, beads &c, 1 case musical boxes, 1 case clocks and watches, F Haller and Co.l; 22 crates 1 cask bottles, 3 cases corks, candles &c, 6 cases freezing mixture and machine, 2 cases furniture, 1 bale carpets, C. Swanston; 1 box apparel, Miss Dowbiggin; 1 case apparel, Myer; 10 trunks boots and shoes, 1 case combs and brushes, W. Robertson; 8 cases hats, 2 cases bale slops, 1 case paint, 2 cases ironmongery, 2 baskets scythe stones, 15 bundles shovels and forks, 1 case passage cloth, 1 cask brooms, G. Hutton; 4 packages brushes, 10 casks vinegar, 3 tons cordage, 1 case iron 6 anchors, 9 tons chain cable, 2 iron tanks, E. Goldsmith; 13 cases pipes, 12 cases pickles, 1 bale carpet, 1 case books, 1 cask china figures, 4 cases toys, 6 cases matches, 3 cases fancy goods, 1 case clocks, 1 case matches, 1 case Cologne water, Isaac Solomon; 12 cases congreves, 10 cases starch, 10 cases blue, T. D. Chapman & Co,; 1 box apparel, Meek; 1 case books, W Elliott; 1 bale rugs, 7 cases oilcloth, 1 bale ticks, 5 hhds hair, 2 cases looking glasses, W. Hamilton; 1 case stationery, W. Carter; 5 tons hoop iron, 2 kegs rivets, Burns, White and Co.; 1 case bibles, J. Dunn; 4 quarter casks wine, 50 hhds beer, 9 rams Brown & Co.; 3 cases 1 cask coach springs &c A. Morrison; 100 casks bottled beer, 5 hhds rum, 1 case patent medicine, L. Roope; 2 cases British goods, W. Fletcher; 1 case to Priaulx, Barlow, Moore, Lord Bishop of Tasmania,; 629 bales bedding, oakum, and 22 cases tin fire-irons, 3 casks tin meat dishes, 9 crates fenders, 1 parcel printed forms, 2 bundles broom handles, 9 bundles mop handles, 8 bundles chairs, 1 bundle coal baskets, 1 bundle handle scrubbing brushes, 5 bundles water pails, 50 bundles furnace bars, 10 bundles bearing bars, 5 bundles boiler ribs, 3 do hearth brooms, 50 iron boilers, 50 plates, 50 flues. 50 steam pipes, 50 furnace fronts, 50 boiler lids, 30 fire dogs, 1 chair, H. M. Government. 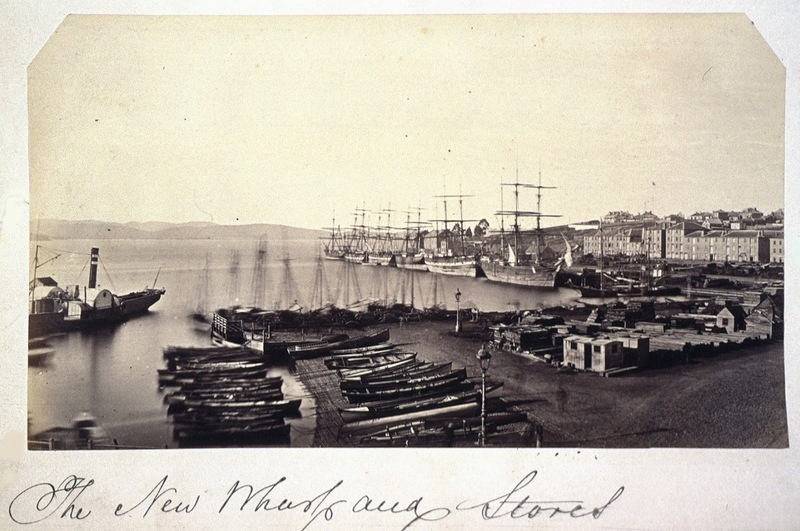 New Wharf and stores, Hobart ca, 1870.